The Date and time YOU choose! An exceptional patient experience starts with an exceptional staff experience! Start here with the program that has moved thousands across the country into positive, long term, people-changing action. Take your staff on an unforgettable journey that will leave them inspired, uplifted and armed with actionable ideas to take the patient experience to new heights! 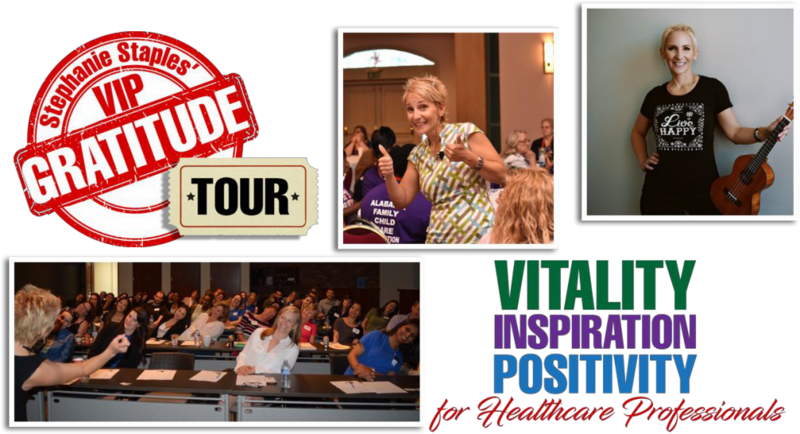 This reWired nurse is an internationally acclaimed speaker, author, consultant & is a Certified HCAHPS Practicing Professional who has been been uplifting healthcare providers and healthcare scores all over North America! She is one of less that 10% of speakers with the Certified Speaking Professional (CSP) designation ensuring you proven quality, commitment and competence. Steph expertly combines her training from Emotional Intelligence, Neuro-Linguistic Programming and Appreciative Inquiry to create a one-of-a-kind, don’t miss a minute, you’ll be talking about this around your dinner table program. You seriously may never be the same. Invest in your staff, your patients, your community with this gift that keeps on giving, book Steph today! Here is an easy to share VIP Tour Info Sheet about the tour to share with your team! Contact our VIP Sponsorship Director, Jen Star, at Jen@YourLifeUnlimited.ca or 204-298-1556!